Do you believe that everything that comes into contact with your skin should be as gentle, pure and natural as possible? 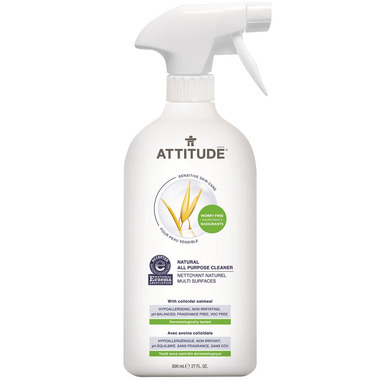 The ATTITUDE Natural All-Purpose Cleaner Sensitive Skin Solution can be used on any type of surface, without irritating your skin. It has superior degreasing properties and is safe for food preparation surfaces. Enriched with colloidal oatmeal, our Natural All-Purpose Cleaner is non-irritating, protective, soothing and hydrating. Free of SLES/SLS, and free of irritants. Aqua (solvent), Propanediol (humectant), Caprylyl glucoside (surfactant), Myristyl glucoside (surfactant), Sodium citrate (chelating agent), Triethyl citrate (antioxidant), Raspberry ketone (skin conditioner), Avena sativa (oat) kernel flour (soothing agent), Allyl caproate (emollient). Avoid irritants, ensure your skin stays well hydrated and keep it protected. Great cleaner. It does have a "cleaning smell" to it initially, but goes away after a few minutes. That is my only reason for 4 stars. My husband, who has fragrance sensitivities, has not noticed a lingering odour after I have used it, which is great. Cleans very well. We will continue to use this product from now on! Overall very happy. It already came higly recommended by a friend, but I am so happy with this product. Tried it in anticipation of our baby's arrival and I am pleased it the result.